As you well know, I love carving and printing stamps. Finding successful and safe ways for children to make their own stamps always feels extra satisfying. 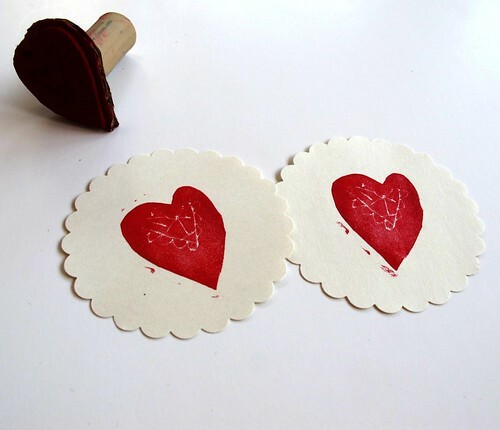 Here's a simple technique for creating stamps that could be applied to many artistic pursuits for multiple ages... but for today-Valentine prints for young stampers. I'm not a fan of craft foam, but some of it has wandered into our art corner... again! Why not utilize its redeeming qualities, and turn it into something that can be used over and over. Craft foam can easily be cut with small (and not so sharp) children scissors and absorbs ink/paint nicely for printing. 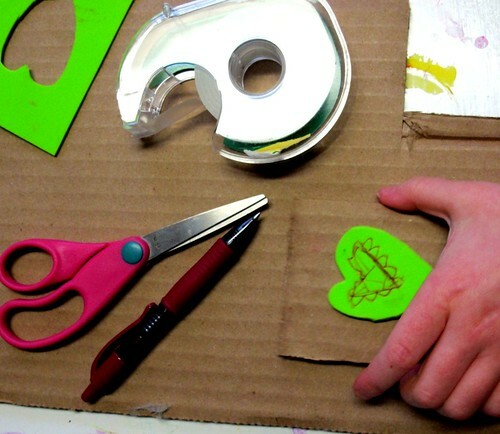 Have child cut out small (around 2 inches) heart- or any shape for that matter. Tape it to a small square of cardboard. 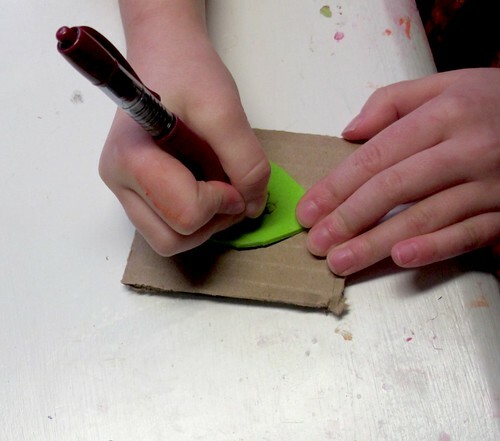 Encourage child to draw a design on foam with pen or pencil. Ask them to press hard. If the foam shape is random vs. a heart... you may want to have them draw a heart in the center using a stencil for help. Cut off the excess card board around the foam. 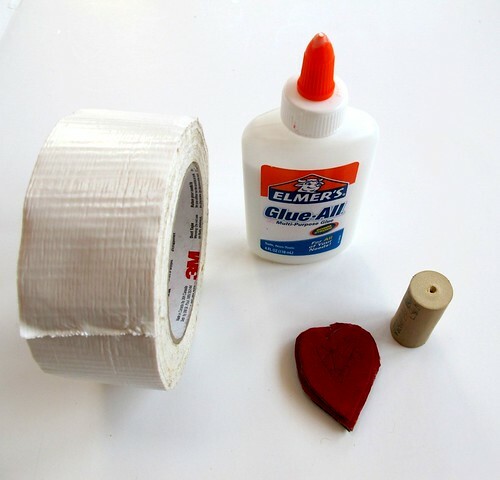 Glue the back of the cardboard to a cork (a wooden spool would work well, too). We didn't want to wait for glue to dry and a little piece of duct tape worked just fine as an instant fix. These would make a wonderful last minute handmade Valentine, as well as a nice addition to any love note throughout the year. And here's a bunch of Valentine inspiration from year's past. Happy Friday and happy stamping! Oh, such good timing. My son is creating a game for a school project and when we were talking about what could go on the back of the question cards, I mentioned he could make his own stamp. He seemed really excited by the idea, but daunted by the process (even with my help). But this would make it much easier, and I think we have some scraps of the dreaded craft foam lying around too. ;) Thanks for the ideas! We shall be giving this a try. Thanks for this idea. Looks pretty easy! :) I should try this with children at school..
Great stamping ideas. We have used rubber erasers before but I still had to do the carving. Using craft foam is a great way to get the boys even more involved in the whole process. Always a very good idea !! J'adoore ! I have a box of foam shapes and I am always looking for ways to use them. Great idea! I wish happy valentines day,and printing is very beautiful. a cork! of course!! i was looking for something to back a recent stamp. this is perfect. the craft foam, btw, is a brilliant idea, safe and easy. we have none, but should it wander in, i now know where to direct it. I love this! We made our own heart stamps for Valentine's Day using the foam stickers from Target. We attached to my daughter's building blocks - perfect for chubby little toddler hands.